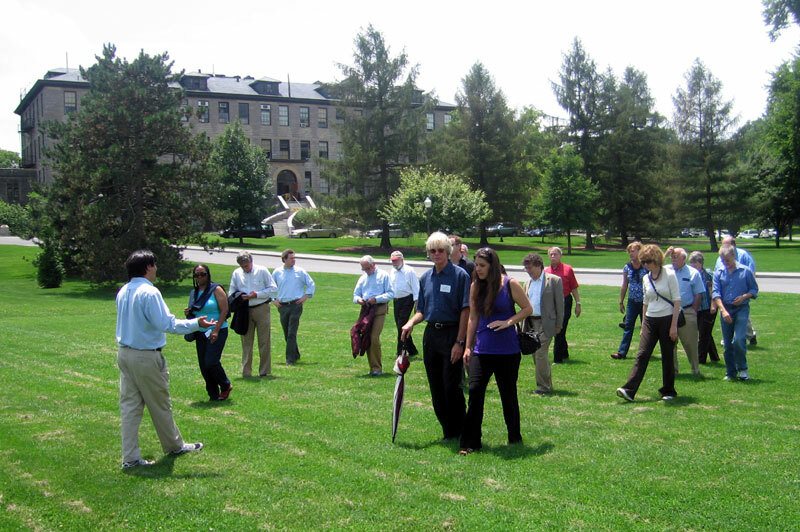 The participants toured the campus. You are on the campus of Virginia Polytechnic Institute and State University. Beginning in the 1980s the preferred name was Virginia Tech. This is a public land-grant university, founded in 1872. You’re in Blacksburg, Virginia, which has a population of about 40,000. And you’re in the New River Valley, on a plateau which sits between the Allegheny mountains and the Blue Ridge Mountains. This university is known for engineering, architecture, science, business, agriculture. In the last few years it’s been emphasizing liberal arts, humanities and social sciences, trying to become more comprehensive. We have 30,739 students, about 24,000 undergraduates. We have about 1,400 faculty. The mascot is the Hokie bird, sort of a turkey-like creature on steroids. It used to be the Virginia Tech fighting gobbler, but somewhere along the line the fighting gobbler became the hokie bird. The team is called the Hokies, and where that comes from is a cheer.